At a recent collaborative workshop between two camps -- in-house counsel and corporate procurement professionals on one side and and law firm partners, finance and marketing professionals on the other -- we had a lively discussion about law firm profits. Most agreed generally with the view that a law firm has a right to profits, but the challenge arises when a law firm is extraordinarily profitable at the same time the client is extraordinarily unhappy with the value delivered. This scenario, one which resonates with many in-house counsel in recent years, leads to increased price pressure from buyers and over time this will depress law firm profits. Predictably, in an effort to boost sagging profits some short-sighted law firm partners will make up for price pressure from one set of clients by raising prices for others, eroding the price-value connection for even more buyers, and accelerating this decline of profits. One in-house participant declared that he requires all outside counsel to submit profitability data and he'll decide what profit margin is acceptable! We can all empathize with buyers who are dissatisfied with the value received at the prices they pay for goods and services. But it's a stretch for the buyer to explicitly decide what profit the supplier should earn, in any marketplace. So how can a law firm both enjoy a healthy profit and satisfy clients? If we adjust our lens a bit, it's not all that difficult - as with many commercial ecosystems, the pursuit of profit can best be maximized by delighting customers, and not as many assume by having one party win while the other loses. Most law firm financial systems are structured to measure short-term profits, that is if there is any measurement structure at all. A surprising number of law firms do not explicitly calculate profitability, and many who do refuse to share these calculations with the partnership out of a misguided concern that it's divisive and corrosive to a collaborative culture. What's more divisive is a culture of not knowing - which naturally leads to most parties making flawed assumptions about their performance relative to their peers. But the root problem is that without a clear understanding of what generates profits and what dilutes profits, no enterprise can sustain itself indefinitely because there will be too many factions working at cross-purposes. When everything supposedly makes money, then nothing makes money. And vice versa. A focus on short-term profits drives and rewards the wrong behavior. Imagine a partner who sees an opportunity to bill a client $100,000 for a litigation defense matter, when that partner's experience could quite easily lead him to counsel the client that he's better off settling rather than defending, and thereby reducing legal costs by $50,000. Or imagine the partner who pads his own time and allows others to pad their time against the client matter, knowing the client will absorb some or all of these costs without complaint because, after all, "They hired us because we're the best and because we're thorough and they should expect to pay a premium for this." In reality, clients are rapidly becoming more sophisticated and can incorporate benchmarking data from other matters and other firms to help identify the "right" price for legal services, and increasingly they know when they're being overcharged. This isn't unlike purchasing an automobile a decade and a half ago before ubiquitous internet research, when price shopping was logistically challenging and buyers expected the dealers to take advantage... and they did. When a buyer discovers he's been overcharged, he doesn't return to that merchant. And therein lies the mathematical basis for focusing on long-term profitability instead of short-term profitability. A law firm that calculates profitability as a function of maximum hours per engagement will, over time, as sure as the sun rises in the East, eventually experience client defections. Client defections (also known as retention rate) caused by over-emphasizing billable hours lead to three serious financial consequences: the cost to acquire a new client is far higher than the cost to maintain or expand an existing relationship; the firm will price itself out of competitive bids; and the firm will eschew efficiency and alternative fee arrangements and forgo potentially higher profits associated with these models. Success can't hinge on finding an endless supply of clueless clients, a task that gets harder every day. To be clear, if we focus on long-term profitability and ignore the many short-term actions we take day in and day out, it's likely that we'll make many wrong and dilutive decisions. So there's nothing wrong with measuring profitability on a smaller scale too. Doing so requires finding the right balance of both big and small factors. 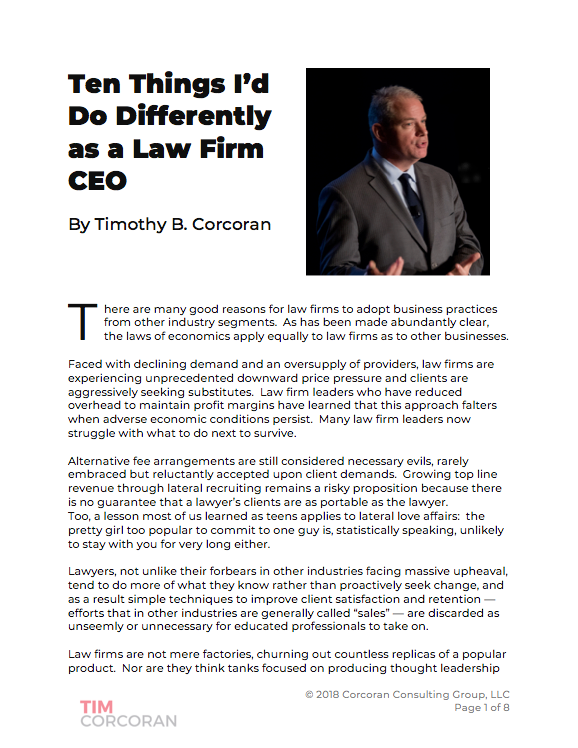 But most law firms measure profitability primarily on the smaller scale. Organizational profitability is typically the derived sum of individual matter profitability, often clustered within practices whose profit contributions are measured and compared. Matter profitability, as we've described above, can be influenced by over-pricing. Is it acceptable if we achieve a 50% profit margin on a $100,000 matter, but in so doing upset and lose the client? Or is it better to achieve a 35% profit margin on a $50,000 matter, followed by a 35% profit margin on four subsequent matters, each acquired at no cost to the firm because a happy client simply assigned the work? Similarly, who should earn the higher reward -- the rainmaker who brings in a $100,00 matter at 50% margin that keeps 5 timekeepers at 60% utilization for 3 months, or the rainmaker and timekeepers who convert a $50,000 matter at a 35% margin that keeps 10 timekeepers at 40% utilization for 2 months into four more $50,000 matters, each at a 35% margin and that also keep 10 timekeepers at 40% utilization for 2 months? I know, I know, the math is getting hard to follow. The point is, sometimes the math is hard to follow so reducing everything to a single, simple point statistic like billed hours, and then basing all rewards and pricing on this one factor, is foolish. Running a business is far more complex. The many variables we've identified already include retention rate, utilization, realization rate, leverage, productivity, penetration rate, cost of sales, cost of goods sold, and more, and this is only a small subset of the variables available to managers who need to make rational decisions about the allocation of resources. Matter profitability shouldn't be diluted by productivity. Matter profitability should balance the revenue generated against the hard costs to deliver the matter, including the compensation associated with the timekeepers billing against the matter. But the compensation should reflect target hours worked by associates, or associate bands. While associates are not truly fungible, in this case we should view their contribution as an interchangeable raw material, so if we replace Mary with Carlton, the underlying cost structure doesn't change. Why? Because if we price our services efficiently based both on our organizational learning curve ("We can complete this task in 5 hours") and the client's perceived value ("This task is worth $3,500 to me"), then an individual contributor's productivity shouldn't have a material impact on our costs of goods sold. Said another way, clients resist first- and second-year associates working on their matters because of the assumption that associates work inefficiently as they learn their craft. By basing the price on a standard cost, we remove the client's objection. Some will complain here that more productive associates are penalized because they're placed in a box along with less productive associates. But productivity is a management issue, not a pricing issue. We don't pay more or less for light bulbs or automobiles or haircuts or vaccinations based on the training level of the person making the product or delivering the service. And legal services shouldn't be priced that way either. Matter profitability shouldn't be diluted by equity and bonus compensation. Partner time can be billed at actual rates rather than a target, if we choose, under the assumption that their variable billing rates already reflect experience and an experienced partner will bill 3 hours at $650 for a task that an inexperienced associate might bill 10 hours at $275. So a pro rata portion of the partner's compensation based on hours billed is a sensible cost to accrue to the matter. But it would be foolish to add in partner equity compensation, or bonuses for either partners or associates, as these costs have nothing at all to do with the matter! In fact, these costs would force the matter profitability to plummet, requiring the firm to significantly increase prices to make it profitable, which as we've described above serves to provoke the opposite effect, namely that no clients will buy any of what the firm is selling. Consider lawyer bonuses and partner equity compensation as SG&A to be addressed elsewhere. Managing a law firm or a practice group is challenging enough without adding a lot of financial math to the mix. But the reality is that no law firm manager should be operating without a clear sense, or hopefully a directional sense, or at bare minimum a vague idea, of how resource allocation and pricing can influence the financial health of the business. Long-term profitability vs. short-term profitability, matter profitability vs. organizational profitability, allocations and overhead and leverage, oh my. Yes, it's hard. But I'm willing to bet that you have a resource on staff, or a phone call away, who can help you sort through these issues. The key is to establish a consistent approach across the firm based on the ideals of firm management. And these ideals should be established based on a fully-informed view of the alternatives and consequences. Welcome to management. No one said it would be easy. For more information about the evolving state of law firm pricing, see Toby Brown's excellent "The State of Legal Pricing 2013."